‘Interference’ literally means meddling, intervention, disturbance. 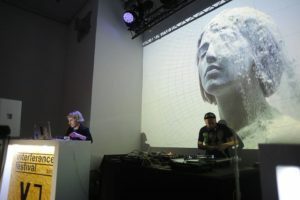 Visuals, music videos, teasers, creative advertising forms, jingles and video art, experiments on the border of art – that is what you’ll see during one of the most interesting events of the kind in Central Europe. Interference Festival equals a new, unconventional form of the open-minded festival in which one the most important aim is to discover and to look for the best video avant-garde artists. Last but not least, there is VJ Battle coming during which the best 8 Vjs will compete on the screen. The main festival points during the fifth edition of the festival will be at the Academy of Fine Arts, Pionowa Gallery, and the Gdańsk Shakespeare Theatre.